Sublimation thermal transfer inks are designed to apply a mirror image onto paper for transfer to the final substrate. The prints are transferred via heat and pressure onto most polyester or synthetic materials. When first printed onto paper, sublimation inks appear to be weaker and duller than standard inks, however when transferred onto suitable substrates, the dyes develop their true color strength and brilliance. (1)Good stability on the machine,clear dot reproduction,excellent ink-water balance. (2)Be able to adapt to the demand for middle-speed or high-speed printing. (3)During the normal condition, use the ink on the machine directly. Polyester fabric, Triacetate fabric, Nylon fabric, Acrylic fabric, Polypropylene nitrile. Surfboards , Skateboards , Snowboards , Skies , Custom Furniture , Interior Design , 3D dye sublimation applications , sublimation aluminum sheet , key rings , display products , plates , mugs , ceramic etc. It applies to all kinds of offset printer, first print image on paper, then transfer the image onto various materials by heat transfer press, especially for polyester fabric. Under high temperature, the ink will become gas and go into fabric. Ink granule is 0.2 um, has high stability and never clogged the printing head. Perfect color saturation and deoxidization. The colors for the inks are bright and the water fastness and light fastness can reach 5 classes. Fabric, mug, plate, metal, wood, ceramic, and etc. First, design image on computer. Second, print the image out with the ink on paper. Third, transfer the image from paper to T-shirt or mugs or other materials by heat transfer press. (1) The color on paper and the color on fabric are different. (2) When print the paper, the design should be mirror image. It means the image on paper is reverse, but after transfer on fabric, the image will be right. The control of the colors is always carried out after the transfer of the final supports. The relationship between the temperature and the time of contact is important in order to have the optimal color resistance and ink penetration (the longer the time of transfer, the better the ink penetration of the fabric). For big quantity, carton inside, wooden case outside or according to clients’ requirements. Henan Zhongliqi Printing Material Ink Co., Ltd is the largest chinese manufacturer of sublimation inks for all commercial printing applications, including offset lithography printing, digital printing, silk-screen printing and rotogravure printing. 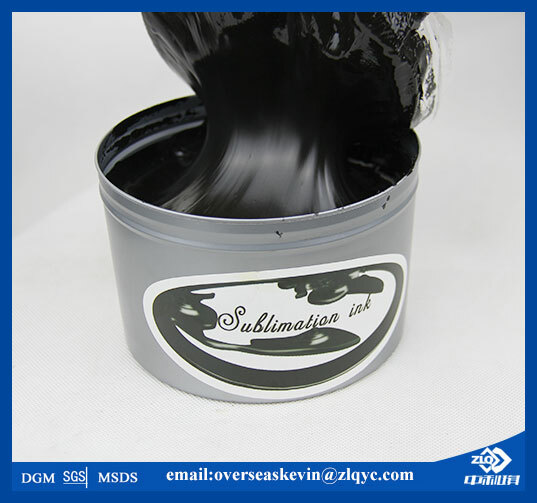 we could supply you the best quality sublimation ink , and give you a competitive price, our products are manufactured in accordance with international standards, such as MSDS, SGS,GDM standards. Note: If you're interested in the product, please submit your requirements and contacts and then we will contact you in two days. We promise that all your informations won't be leaked to anyone. Copy Right: Henan Zhongliqi Sublimation Offset Ink Co.,Ltd.